In good grooming, a perfect shave is necessary. The Braun Series 5-590cc is here for the men who want to roll in style. This shaver gives good value for money and it is one of the best in the market. 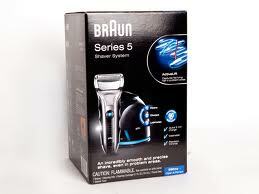 In fact, it is the most advanced shaver from the Braun series 5 lines. It has various distinctive features that make it stand out from the rest. Some of them include the A 4 –stage LED display, which is a feature to show the user the charging updates, battery and the hygiene condition. It is a precision long hair trimmer and thus it is able to cut even the long hair. Braun Series 5-590cc has a triple action cutting system that consists of three cutting elements. It can shave long hair as easily as the short hair. Contour adaptive shaving is another of its robust features. This one allows you to shave in different places with no difficulties whatsoever. Areas like the jawline and under chin can be very hectic to shave and Braun Series 5-590cc shaver is better and easy to shave all these areas because of this wonderful feature. Hygiene is important because you are safe from any kind of infections, wash-ability and 100% waterproof is another great feature in Braun Series 5-590cc. Its sealed body can be washed under running water. It has a powerful li-ion battery that is very effective. This means that it is rechargeable and does not have memory effect. The last feature, the deal breaker feature, is the Braun clean and renew system available in almost all Braun models. It allows room for automatic cleaning, charging, lubricating and charging by pressing a button.